Recently an article surfaced by NAMM discrediting the Stone-Safe Memorial System. Please read our response regarding important information on ground anchors. NAMM states on their website important information on ground anchors that recently a mis leading advert regarding stone safe support system was distributed in the institute of cemetery and crematorium management journal (ICCM) and in the federation of burial and cremation authorities (FBCA). Our advert was not misleading! The memorials in which the highest part if any component is greater than 625mm above the ground level shall be designed to with stand a horizontal load of 70kgs. This is incorrect and the figure should be 100kgs. The 70kgs referred to a mason/memorial fixer installing a memorial in a cemetery or a churchyard which has to withstand this force once he has completed the installation. That force is then doubled to 150kgs in order to be an accredited fixing system. Burial authorities carry out a push test at 25 kgs. The article also states that the test is to be carried out in a soil condition equivalent to sharp sand. NAMM states that this information is incorrect. The bs8415 document section 5321A states that the soil condition is of a medium sand or gravel. Sharp sand and medium coarse sand is one of the same, in other words it’s sand with crushed gravel with up to 0.5mm in size. The article also states that following public testing the only single pre cast concrete/stability system that complies with British standards BS8415 of 2005+A2 2012 and satisfies the British standards institute is the stone safe bolted solution. 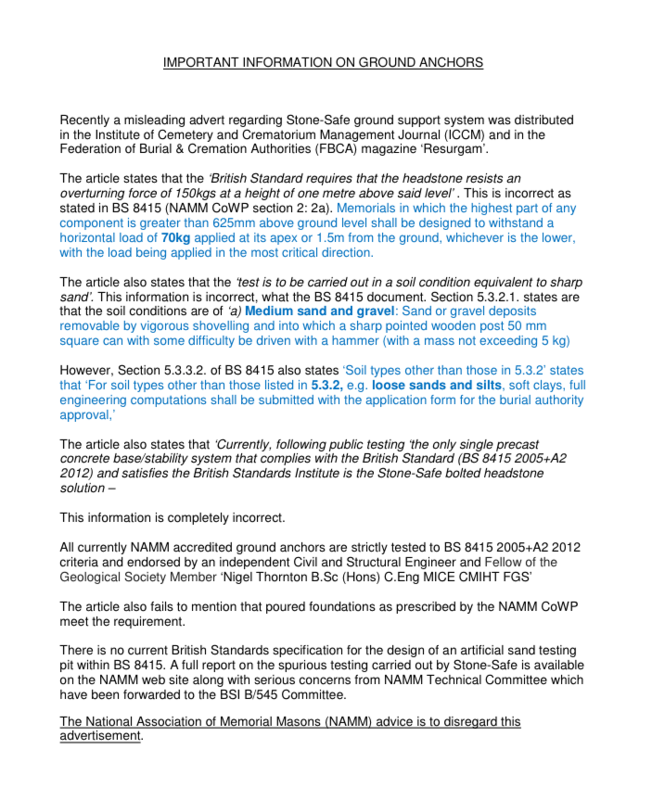 NAMM states this information is completely incorrect and simply an attempt to discredit the British standards committee and the current ground anchor procedure for the personal gain of stone safe ground anchors. Having made the above accusation let me remind you that BS8415/2012 committee agreed that no longer was it just NAMM who can carry out a memorial pull force test. Anyone can now carry out a test subject to the following conditions. Annex F1 general. The load test in this annex shall be carried out under supervision under a charter or incorporated civil or structural engineer. The photographic record of the test shall be made and included in the test report, the ground used for test shall be medium sand or gravel. In all of the tests that have been carried out under the supervision of independent civil engineers and a independent BSI approved test centre in various soil conditions not once has a pin fixing system complied with the required standard. The test results reports can be downloaded from our website. New and re instated monuments shall be designed and constructed to provide a stable structure that is serviceable which provides satisfactory performance for the life if a monument. NAMM states that there is no current British standard specification for the design of artificial sand testing pit within BS8415. We were informed by both the testing section and the construction section of the British standards institute that this is a correct method of carrying out a product test. In fact when we had our own system tested by an independent BSI test centre this was the method used. NAMM states in our advert that the advice is to be dis regarded “this false propaganda as stone safe are continuing to undermined current legislation in favour of their own commercial interest by trying to discredited other ground anchor manufacturers”. As a trade association I would remind them of best practice. Traditional methods of installing a memorial should be regarded as a base from which improvements of memorial safety could develop and not as a practice to be blindly followed. If is essential that best working practices should develop in the light of modern technology. The best memorial fixer or mason Is the one with the open mind whom embraces changes and uses his own skills and experience to constantly seek a higher standard than bashing a pin into a unknown soil condition that could contain a void from the back fill of a grave. With health and safety in the work place it is of a paramount importance and must be stressed that safety of a memorial installation is totally dependant both on the soil condition, the height and weight of the memorial and size of the ground anchor. The larger the diameter of the ground anchor the more stable the memorial.